People take part in a rally against the murder of Brazilian councilwoman Marielle Franco, in Sao Paulo, Brazil, March 15, 2018. Thousands took to the streets of Brazil’s largest cities Thursday night to protest the execution-style murder of a popular Rio de Janeiro city councilwoman, an outspoken critic of police killings of poor residents. Investigators, prosecutors and even drug gang leaders said the shooting of Marielle Franco, 38, a rising star in the Socialism and Liberty Party (PSOL), appeared to be a political assassination. Franco, an activist for human rights and women’s causes, was killed along with her driver on Rio’s dangerous north side around 9:30 p.m. Wednesday night. Her press secretary, who was traveling in the same vehicle, suffered minor injuries but was not shot. Thousands of people gather to mourn Rio de Janeiro's city councillor Marielle Franco, 38, who was shot dead, outside State Assembly in Rio de Janeiro, Brazil, March 15, 2018. Just weeks ago, the federal government decreed that Brazil’s army would take over all security operations through the end of the year in Rio, where murders have risen sharply. Franco, part of a commission to oversee the military intervention, harshly criticized the move Sunday, saying it could worsen police violence against residents. “It is far too soon to say, but we are obviously looking at this as a murder in response to her political work, that is a main theory,” said a Rio de Janeiro public prosecutor, who spoke on condition that he not be named as he was not authorized to discuss the case. Rivaldo Barbosa, head of Rio’s Civil Police, told reporters, “One of the possibilities in analysis is, yes, an execution.” He did not speculate on who may have been responsible. An investigator with the city’s police force went further, saying the prime motive appeared to be Franco’s calling out police for allegedly killing innocents in their constant battles with drug gangs. Political violence is common in Brazil, but typically in smaller or more impoverished cities. In the months before the 2016 city council elections in Baixada Fluminense, a hardscrabble region the size of Denmark that surrounds Rio, at least 13 politicians or candidates were murdered before ballots were cast. As night fell Thursday, crowds gathered in Rio, Sao Paulo and several other cities, with protesters holding aloft banners calling for justice and an end to Brazil’s endemic violence. “The path of her own fight is what gives us the strength to carry on,” said Danielle Ramos, 26, who was attending a rally in Rio de Janeiro in front of the city council building, along with thousands of others. “The best way to honor Marielle is to dedicate every second of our days to the fight that she was a part of,” said Ramos, part of the Olga Benario Womens’ Movement, which battles against violence. Franco, who was raised in the Mare complex of slums, long one of Rio’s more dangerous areas, received more than 46,500 votes in the 2016 election. That total was bested by only four of 51 council members. On Sunday on her Facebook page, Franco decried what she alleged to be the police killing of two boys during a police raid in an area called Acari. Calls to the police unit assigned to the Acari area were not returned. In a Sunday statement to the O Dia newspaper, police said they carried out an operation in the area, were fired upon by drug traffickers and returned fire, but had no knowledge of any deaths. Mare’s roughly 130,000 residents must contend with the presence of Rio’s two most powerful gangs, the Red Command and the Pure Third Command. There are also militias often made up of off-duty or retired police and firefighters who are as feared as the gangs. High-level members of both the Red Command and the Pure Third Command told Reuters their gangs had nothing to do with the killings. It was impossible to reach any militia members. Jungmann said federal investigators would be involved in the investigation and that he had put Brazil’s federal police at the disposal of local investigators. 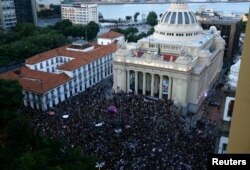 Hundreds of mourners gathered outside Rio’s city council building, where Franco’s body briefly lay in state, while vigils and protests were planned in at least six other cities in Brazil. About 150 members of the PSOL party on Thursday entered Brazil’s federal Congress carrying flowers and signs demanding justice. The United Nations office in Brazil and Amnesty International demanded a quick, transparent investigation into Franco’s killing.